If you liked this show, you should follow Perfectly Healthy and Toned Radio. Hannah Crum visits Perfectly Healthy And Toned Radio to chat about the benefits of Kombucha. Kombucha Kamp’s mission is to “change the world, one gut at a time” by educating and empowering everyone to ferment food and drink safely at home, just as we have throughout human history. Research continues to prove that all living things are truly “Bacteria Powered,” and humans need all the good bacteria we can get! I’m Hannah Crum, affectionately dubbed “The Kombucha Mamma,” and since 2004 I have been brewing Kombucha and educating others about how easy it is to make this delicious and healthy “longevity elixir.” What began as a love of lip-puckering brew, this enjoyable process has evolved into my passion and lifestyle. From homebrew hobbiest, to educator, to Master Brewer, Kombucha Kamp has grown organically as my experience has deepened. At Kombucha Kamp, we are committed to providing the most accurate and up-to-date information to Kombucha lovers and homebrewers at any stage in their experience. 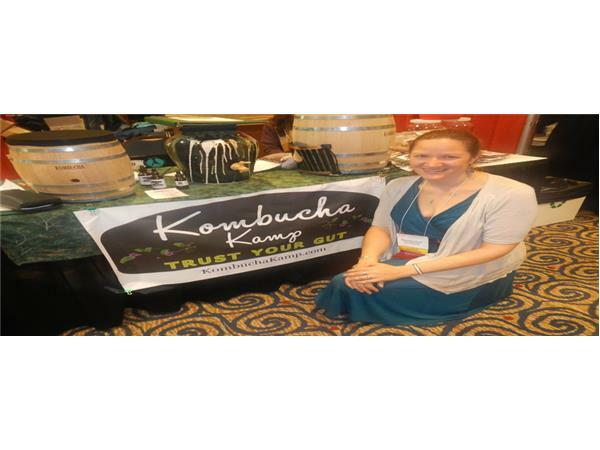 I have taught Kombucha making classes to all size groups, from individuals to workshops of 100+, all over the country fornearly 8 years for over a decade, spreading the message of Kombucha and its bacterial benefits far and wide through a variety of venues including festivals, health conferences, podcasts, interviews, articles and more. Our how-to videos have piled up +100,000’s of views and Kombucha Kamp was featured on “What’s Brewing?” hosted by Jody Rudman on the Veria Network.